The NFL hosted its first-ever veteran combine this weekend, a chance for players who have fallen out of the league for one reason or another to claw their way back onto an NFL roster by proving that they've still got it. Michael Sam was there! So were Felix Jones, Michael Bush, and a lot of other names you'd recognize. It was sad. Felix Jones used to be fast as hell! He's still just 27 years old, and now he's out here running 40 times that wouldn't look out of place next to a lineman's name. Michael Bush was never much of a speedster, but 4.96? Yeesh. How are you feeling about that, Michael? These guys almost certainly aren't in the same peak physical conditions they were when they had jobs, but they aren't decrepit old men, either. Mikel Leshoure is only 24! Football is a young man's game. These slow times make me wonder what we'd see if players who are currently on rosters had to participate in the combine. How can we know for sure Frank Gore or Reggie Wayne wouldn't be out here running 5.1-second 40s? 1. There's a reason why a lot of these vets are unsigned. Even on a relatively slow track, the 40 times were plodding. Former Cowboys running back Felix Jones, who once was speedy, ran 4.79 and 4.85 times in his 40-yard dashes. 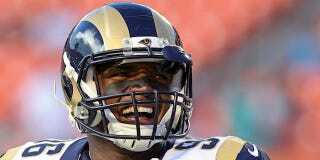 Michael Sam couldn't crack a 5-flat 40. There was talk that one of the 105 ran the 40 in six seconds. You know, Rich Eisen time. 2. "There may be a few back-end-of-the-roster training-camp players," said one GM on hand, "but that's it." 3. Players had to pay a fee to work out for NFL teams. There's something tawdry about that in the first place, for a multibillion-dollar enterprise such as the NFL. If the "prospects" were truly prospects, why are they paying to be seen? If it's programming for NFL Network, or just another slow-day news story for the league to drag out (some 40 media members covered the show on Sunday), then the veterans combine is not being done for the right reason—the right reason being the league is looking for prospects. Visitors to the event walked away with one overriding thought: That was sad. When Peter King, who spent the first half of his column sitting in a booster seat and accepting spoonfuls of talking points from Roger Goodell, feels the need to call something "tawdry," you know things are really bad. Let's maybe not do this anymore.